Dinevi Resort is a family resort. Almost a third of our guests are children up to 10 years old. Many factors contribute towards the family atmosphere of the resort: Not least the green areas, where the children play freely until late whilst the parents watch them from the balconies. Add to that the quiet streets between the complexes, good evening lighting and 24-hour security throughout the whole resort and it makes for a safe, family friendly environment. If you have chosen a family holiday with us then you’ve made a wise and healthy choice. 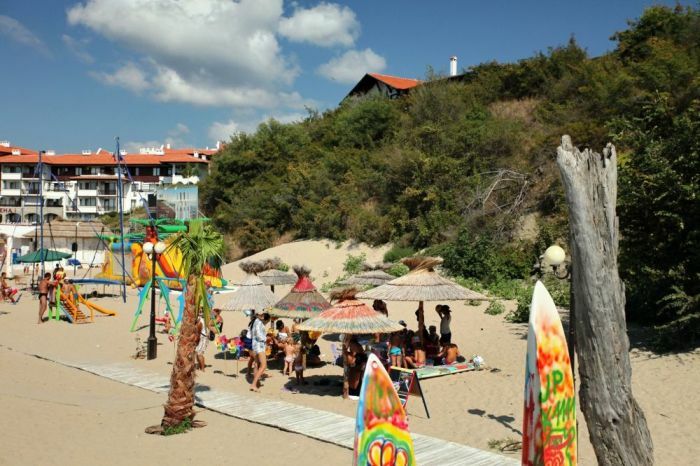 St.Vlas is the only climate resort in Bulgaria and its effect is felt mostly by children. Here breathing is easier for everyone, the appetite improves, the nights are not stuffy and offer a peaceful dreamy sleep. The sea and the sand have their healing effect on children, strengthening their body constitution ready to resist the coming winter ailments. In order to enrich the healthy stay of your children with us we have designed an interesting activity programme which corresponds to the character of our resort. The children’s corner on the beach in front of the ‘Arena’ complex is open to all children 6 days a week (not Mondays) from 9.00 to 13.30, free of charge. You will recognize the place by the waving red flag bearing the word Animation. Our smiling children’s entertainers, in red outfits, will already have made acquaintance with you and your child on the beach. The children’s corner is not enclosed, so children should not be left entirely in the care of the entertainers. Parents must be nearby to supervise their children and respond if needed. The activities in the corner alternate quiet creative occupations with dynamic games on the sand, sports activities, musical gymnastics, even activities that involve the parents for guaranteed fun. Once a week there is a theme day, such as Olympic Day, Seek & Find or Harry Potter, where children have fun playing in teams. 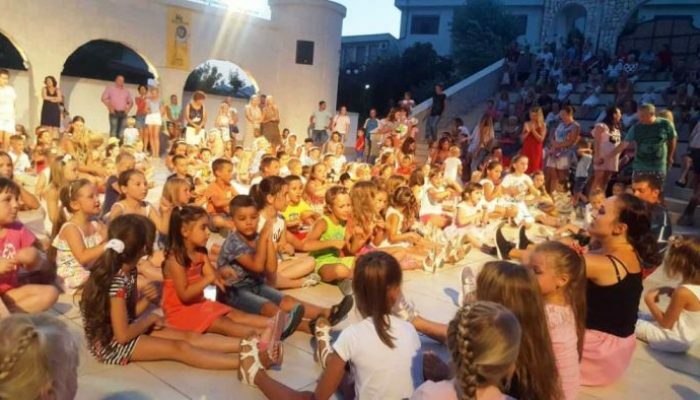 All children are invited to our Kid’s disco, held three times a week, on Tuesdays, Thursdays and Sundays, from 8pm at the Arena Amphitheater. Entrance is free. The disco dancing lasts around 45 minutes with a playlist of songs in several languages, ​​depending upon the children’s nationalities. Our little guests love to join in with our club dance routine. 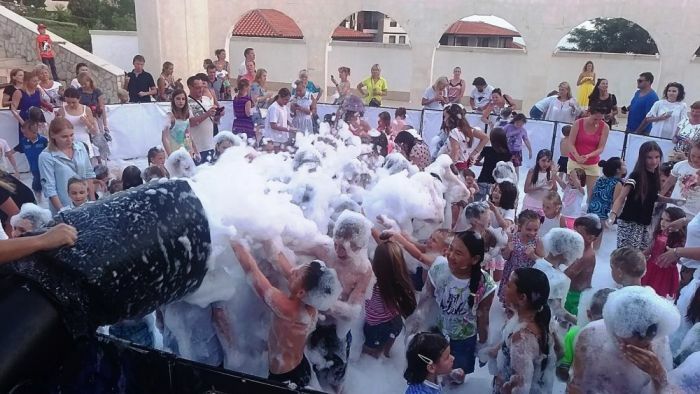 On some days the disco is replaced by other children’s entertainment, such as foam party, zumba party or theatre. The Talent Show is a performance starring the children themselves – with or without previous preparation. All children are invited onto the stage to show off their talents. In addition to our children’s programme, the ARENA Amphitheater will host a variety of other performances, most of them a gift to the guests of Dinevi Resort and St. Vlas. The full schedule for the amphitheatre is here. Fencing is a sport that combines athleticism, emotion and intellect for all ages. You are invited to learn the values of the brave knights and experience the charm of the sabre movements. The participants are given sabre, mask and protective gear. They also will receive a diploma at the end of the 3 hour course. Where: the Arena amphitheatre; Price: 60lv for 3 days of training, 1 hour each day. Our fencing school is a joint project of the Dinevi resort and the V.Etropolski Fencing Academy. The national fencing coaches come to St. Vlas. Training starts at the end of June. Our yacht resort challenges you to experience the might of the wind and the sea at the same time! The sailing class lasts 2 hours. In the first hour you will be taught the basics of sailing – marine orientation, making knots, the Rose of Winds and the parts of a sailing yacht. 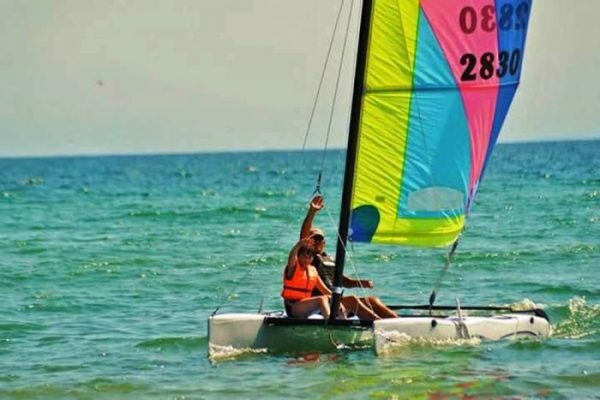 In the second hour you make a 30-minute sailing trip on an 8-meter catamaran in the sea in front of the beach. All participants have the chance to navigate the boat under the guidance of an instructor. Suitable for the whole family. Where: the windsurf school at the beach below the ‘Monastery’ complex. Price: 30lv per person. The Action Aqua park in Sunny Beach. A water attraction for the whole family. Enjoy either a half or a full day. Tickets purchased via this web site, with accommodation, come with a 10% reduction off the normal price. The boat trip from St.Vlas to Nessebar Old town and back. The boat leaves every hour, on the hour, from Pontoon 4 at the Marina Dinevi. This is a real sea adventure in 30 minutes. The Black Sam pirate ship is a great sea attraction with day and evening programmes and plenty of opportunities for great photos. The Pirate ship sets sail from Marina Dinevi. Yoga for children at the open yoga centre on the beach in front of the Arena complex. Our advice to parents for children’s health is to protect them from exposure to the full sun and limit their time in the water during the first one or two days by the sea. 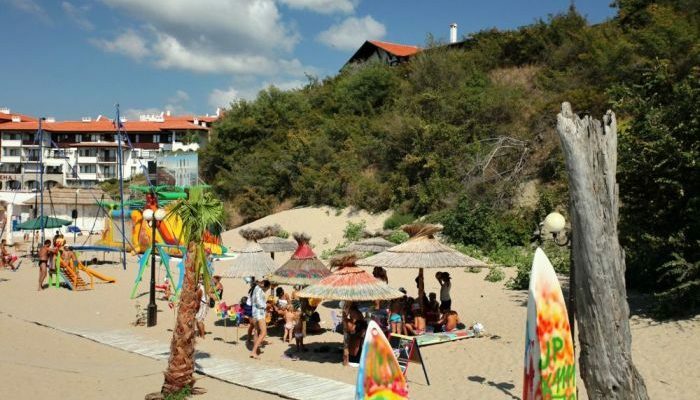 Often children come to St.Vlas from colder climates and are not used to the sun, they happily spend the whole day splashing in the sea and under the hot sun. On the second or third day there are the signs of sunburn, overheating, fever, stomach discomfort and so on. So please be cautious! Treatment at the ‘Madjurov’ Medical Center will normally be covered by travel insurance provided by your tour operator, assuming you have chosen to take it. However, it is important to know that, as a rule, such policies have low limits and may not provide cover for urgent conditions, such as appendicitis for example. We recommend our guests, especially our individual guests and those with a longer stay in St.Vlas, take out new health insurance in Bulgaria for all of the family or at least the most vulnerable. The cost of the insurance is 0.61 lv (0,31 Eur) per day per person. Insurance can be purchased online through this site or at our main reception desk at the ‘Diamond’ complex.